Last month, the adaptation of the MMORPG video game Warcraft was officially given a release date of December 18th, 2015. Before that, names like Colin Farrell and Paula Patton were said to be in talks for the fantasy epic, but no story details were known at the time. But this past weekend, director Duncan Jones appeared at BlizzCon 2013, the convention for fans of the game series, and we finally have some tidbits on what and who the movie will follow. 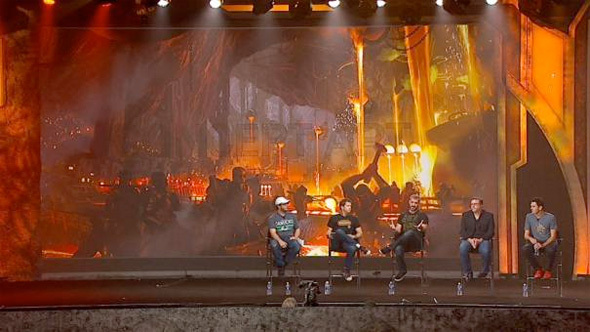 And if that's not enough, some concept art of four locations has also been revealed, and the style feels like Star Wars meets Lord of the Rings and it looks pretty cool. As for the story, it will follow Anduin Lothar facing off against Durotan, the two human and orc heroes from the original real-time strategy games, before World of Warcraft was even created. The film will largely focus on the Eastern Kingdoms of Azeroth, as you can see. And if you're worried about how Jones is going to bring these epic locations to life, cinematographer Simon Duggan (The Great Gatsby), will be behind the camera. Also, Avatar costume designer Mayes Rubeo is on board the film, so that's good news. As for the action, special effects supervisor Bill Westenhofer compared the film to Gladiator and said, "The swords that are being built are the biggest swords a human being can wield." Sounds pretty promising to us. Those look nice. Is that what they're suppossed to look like? lol... wait... the same day as Episode VII?! Seriously? Tell ya what... just stop production now... give me what's left of the funds... and I'll put 'em to better use. Promise. two awesome movies came out on the same day, what else do you want idiot? Well "idiot", as much as I appreciate the insult, and I can't believe I'm actually responding to your intelligent, well thought out reply... I'll do so in the hopes of educating you. As a fan of both franchises (disclaimer - much more so of the Star Wars variety,) I'd like them both to do well and earn enough money for the studios to consider sequels. It is no secret, and has been proven time and time again, that releasing a new franchise (Warcraft in this instance,) the same day as a much more popular, well established franchise with a virtually unlimited budget (Star Wars,) would be financial movie suicide. Everyone will go see Star Wars, no one but die hard fans will see Warcraft. I myself, even as a Warcraft fan, would likely put it on hold, and maybe even see Star Wars twice before I saw Warcraft. It seems like a terrible business decision, when they could release it at a later date and quite possibly completely dominate the box office. I would bet most of my family that this date will change when somebody at Activision realizes this. Also - the correct tense of "come" in your reply would be "coming" and not "came" - just fyi. I don't even really speak a second language, so kudos to you. really, you figured all this out from 4 pics above. Star Wars was well established franchise but there is nothing new about it. Star wars is Star wars. on the other hand,Wow had more than 12 million members. with Duncan Jones as director, this movie will be an awesome adventure for both fans of the game and everybody else. just because you are star wars fan please don't try to educate other people. It is embarrassing. everybody on this site knows much more about movies than you. Well... apparently not EVERYBODY knows much more about movies than me. I didn't figure it out from "4 pics above". It's just a pretty well known fact (backed up by decades of financial numbers from the box office,) that putting a lesser known franchise release up against a really popular one (one that has grossed an estimated $72 billion over it's lifetime,) on the same day will hurt sales figures - substantially I predict in this case. I certainly hope it will be an awesome movie, and as stated, wish it all the best (WoW player for years myself,) but really hope they consider moving the release date. Apologies, may have mis-typed - re-searching comes up with $27 billion - Google - plenty of sources. "Execs are intelligent people..." - eh, that's debatable & depends on the exec. Seen some pretty stupid decisions in my day that seemed elementary. Though, there is generally lots more going on behind the scenes that we (the public) aren't aware of. (politics, budgets, tempers, ego's, etc) I do have faith in this case though, as it would be a monumentally poor decision - especially with the potential the Warcraft IP has behind it. Though, why this movie has been in production purgatory for... what... five years... is beyond me and speaks poorly re: the intelligence of the execs. Likely would have done much better in WoW's heyday ('09-'10). I have a rule I like to live by and I shall pass it on to you, "Don't argue with stupid". Obviously they made the release announcement before Star Wars and they will adjust it accordingly. Heh - yeah, no idea why I'm even trying, just passionate about, well really both franchises, & hopefully educating whether he likes it or not. just because you know something that does not make you smarter than anybody else. for someone smart please check your spells before post your comments. I'm not that smart. I just understand the film business a little and realize that no other potential franchise would want to compete with Star Wars. Don't judge too early, the last three was horrible. 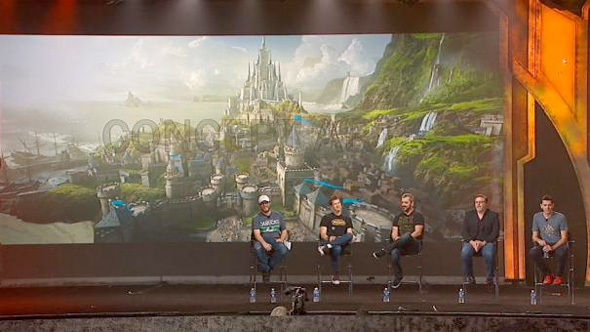 "Here's the concept art showing Stormwind, Draenor, Dalaran and Ironforge, in that order" Except they're not. The first is Draenor. Then Dalaran, Ironforge, and Stormwind is the last pic. Just an FYI. Thanks, I thought I had the order right, but I read the captions on Kotaku's story wrong. It's fixed now. I thought they were planing to do this movie with practical effect. How are they going to build any of that? It's not going to be all practical effects. But they're going to be using a lot of practical make-up and creature effects. They still need plenty of visual effects for the expansive fantasy locations. You'd be surprised how much visual effects are used, even in non VFX heavy films, to build sets and make everything seem real. The word EPIC never get boring. AND "Duncan Jones" is EPIC as Warcraft as. I admire his previous work (like many others) I admire his "DARE" for works he done. Moon & Source Code were HARD MOVIES. I am optimistic about the future. This is ultimate game & i think time will come very soon for another experiencing of an UNFORGETTABLE MYTHOLOGICAL PURE FANTASY. I'll be more impressed by a good script.